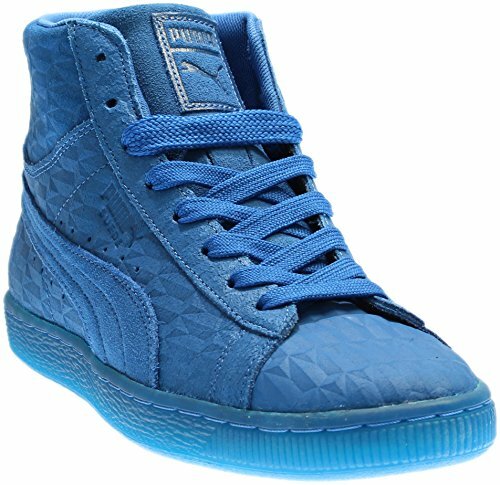 PUMA Men's Suede Mid Me Iced Royal/White Athletic Shoe by PUMA at Mas Fashion. MPN: 36186102-400. Hurry! Limited time offer. Offer valid only while supplies last. Your style is too cold to freeze! Suede upper. Lace-up closure. Brand logo hits throughout. Soft fabric lining and footbed. Rubber outsole. Imported. Your style is too cold to freeze! Suede upper. Lace-up closure. Brand logo hits throughout. Soft fabric lining and footbed. Rubber outsole. Imported. Measurements: Weight: 1 lb Product measurements were taken using size 11, width D - Medium. Please note that measurements may vary by size. Soft fabric lining and footbed. Rubber outsole. Imported. Measurements: Weight: 1 lb Product measurements were taken using size 11, width D - Medium. Please note that measurements may vary by size.